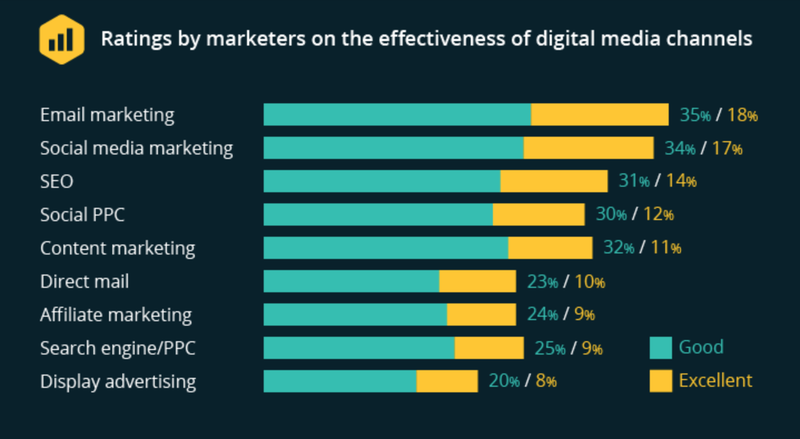 According to McKinsey&Company, email marketing is 40 times more effective than social media and marketers still rate this strategy as the most effective, according to Smart Insights research on the State of Email marketing in 2017. Now, creating a killer email marketing strategy can take time and one of your biggest challenges is maximising deliverability and open rates. You’re simply not going to get results if your emails aren’t landing in people’s inboxes and things aren’t much better if they do, but nobody opens them. In fact, low deliverability and open rates are two of the biggest signals to internet service providers (ISPs) that you’re sending low-quality emails, which can leave you in a nasty cycle of ending up in the spam folder. To help you avoid this, here are fifteen ways to improve email deliverability and open rates. The reputation of your email IP address and website domain are crucial when it comes to maximising deliverability. Mailbox providers such as Gmail and Outlook want to stop their users being bombarded by spam and crapy mails, using algorithms to filter and block mails that pose a risk or fill up their inbox with junk. Your domain reputation relates to your web address and this is just as (or more) important than your email IP address, depending on the algorithm of each provider. In terms of your email IP address, the first thing you need to do is make sure you have a dedicated IP, not a shared address. You don’t other people’s poor email strategies holding back your own so it’s worth taking the time to build and maintain a positive reputation on your own dedicated IP address. I’m not here to tell you that buying email lists is bad or ineffective (it certainly worked for Airbnb) but you’re never going to maximise deliverability or open rates with this approach. You may even end up in hot water with the authorities or regulators – unless you become a major startup success and all is forgiven, of course. Nope, to get the best delivery and open rates, you’re going to have to do this the old-fashioned way, bu building your own email list comprising of people who actually signed up to receive your mails. Before you send out any new email campaign, it’s a good idea to check your mails to get a spam rating. This will grade how likely your emails are to get flagged up by the spam filters and highlight any keywords you’re using that act as red flags. 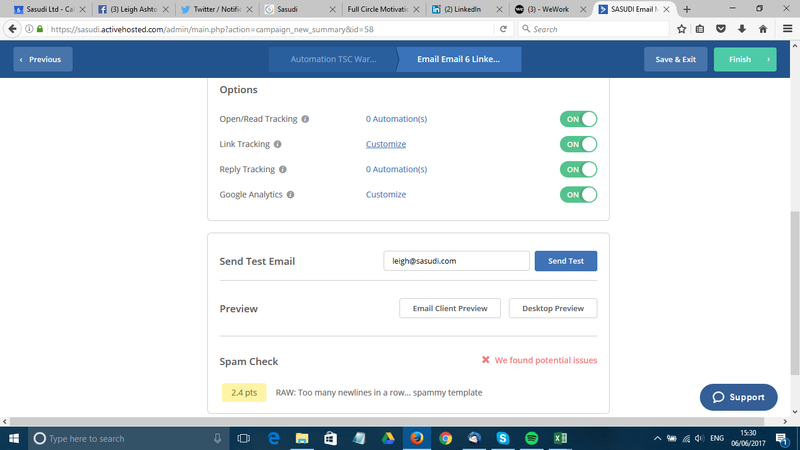 There are plenty of dedicated email spam score tools but there should also be one included in your email marketing platform. We use ActiveCampaign, which automatically runs a spam check on every campaign you create, scanning the content of your emails for any potential problems. Once you’ve tested and sent out your emails, you’ll want to make sure they’re getting through to each mailbox provider. Create accounts with Gmail, Outlook, Yahoo and every other provider you want to test for and make sure they’re getting through. This isn’t a comprehensive test, of course, but it gives you a good idea that there are no obvious problems preventing your mails from getting through to these inboxes. 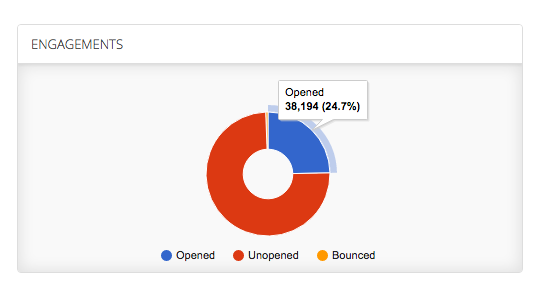 Just make sure you open the mails after receiving them so you don’t add any negative juice to your open rates. When it comes to open rates, relevance is everything and generic emails are always at risk of being ignored. You need to capture people’s interest in a single subject line and this can be particularly difficult for the first few emails when you don’t know enough about users to target them with more specific messages. The thing is, you can find out enough about these users before they even hit the submit button on your email signup form. We use Leadformly to create multi-step forms using conditional logic that allows us to get more detailed information about what each user needs from us and this allows us to be highly relative from the very first email we send them. Best of all, we can automate this process with ActiveCampaign so we’re sending out highly-relevant emails without having to manually select which message to send. A double opt-in campaign simply sends users a confirmation email after they’ve submitted their details and they’re not added to your list until they click the confirmation link in your mail. First of all, this confirms the email address you’ve received is valid and active but it also increases the quality of leads on your list because they’ve already engaged with you after the signup process. This shouldn’t add any unnecessary friction either, if you’re segmenting your lists on the page via Leadformly and your email automation platform. 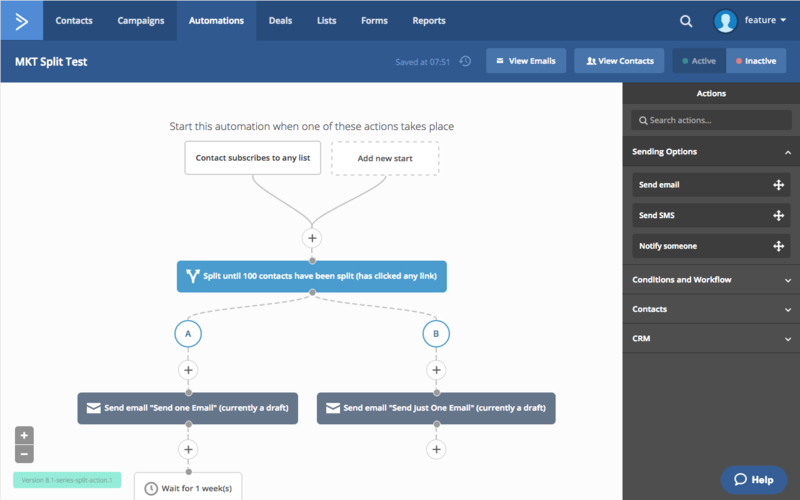 Once again, you can automate all of this with an email marketing platform like ActiveCampaign. A hard bounce is when an email is sent to an email address that is no longer active or simply doesn’t exist. Rack up too many of these hard bounces and all of the major ISPs will start to suppress the delivery of your mails. This is one reason why double opt-ins are so important but you’ll also want to keep on top of hard bounces because an email account can be closed at any time. ideally, you want to stop sending emails to these addresses as soon as you detect a problem to prevent your IP reputation being damaged. A small number of hard bounces isn’t going to kill your email marketing strategy but this is something you definitely want to manage. A soft bounce is when an email message is sent to an account that is full or temporarily unavailable for whatever reason – eg: their server is down. These are significantly less damaging than hard bounces but it’s still worth keeping on top of these and removing contacts that result in multiple soft bounces. Sometimes, your mails will get through to people but you simply won’t get any opens from this contact for an extended period of time. Unfortunately, this is gradually doing damage to your reputation with ISPs and you have to choose a cut-off point where you say enough is enough. Whether you decide it’s a year, six months or less (it may vary by each campaign), choose your cut-off point because a few hundred of these users collectively can become a problem. Spam traps are email addresses used by ISPs and blacklisters to identify spam emailers and having your mails land in one of these accounts can really hurt your sender score. The problem is, these can look just like any other email address and, in some cases, contacts you legitimately added to your email list could turn into spam traps in the future. The most common type of spam trap is accounts that have never been used by anyone and these are normally found on bout email lists. Because these accounts are inactive, they can’t opt-in to anything so you can avoid these relatively easily by not buying email lists and having the proper opt-in process in place. However, ISPs and blacklisters also take over inactive email addresses that haven’t been used for a long period (normally 18 months) and this means contacts on your list could also turn into spam traps. Which is why it’s important to remove contacts that haven’t show any activity for extended periods of time. As mentioned earlier, you only have one subject line to convince people to open your emails (assuming they see them to begin with). Which means you’re going to want to test these to improve results, pinpoint issues and learn from your successes/failures over time. This is something you’ll want to look out for in any email marketing platform you use – the ability to A/B test subject lines (among other things). Emails with attachments in them a major red flag for spam – just don’t do it. If you want to send something like a PDF or a video to your recipients, include a link pointing to the resource instead – or an image link in the case of a video. Speaking of links, anytime you’re going to include one in your emails, make sure you never use IP addresses – eg: http://193.241.33.1/page/. It’s unlikely you’re ever going to do this but IP address links are commonly used by phishers and spammers and this is another red flag. Pay attention to any links for third-party resources you link to in your emails to make sure they’re also not IP addresses. Another important tip for maintaining a good reputation with ISPs is to use reputable email marketing platforms. We recommend sticking to professional tools such as ActiveCampaign, SendinBlue or HubSpot that are typically used by reputable businesses for genuine email marketing purposes. Take a look at our list of the best email marketing platforms if you need any help with choosing the right tool your business. Finally, make sure your act on email campaigns that aren’t achieving the right level of deliverability or open rates. Don’t let performance continue to slide because this can damage your reputation and hurt future performance. As soon as you detect any issues, test variations and compare results to try and pinpoint the cause of problems. Start with your subject lines if open rates are the problem and reassess your content if you’re having deliverability issues. Above all, maintain your contact lists and make sure you’re not being held back by hard bounces, spam traps and other performance killers. If you need any more tips on making more of your email marketing efforts, take a look at our guide to automated evergreen webinars – you won’t be disappointed.